A woman's kitchen is a playground of sorts, a small peek into who that woman might be. Is she like Carrie Bradshaw who prefers to store shoes in the oven or is she whipping up indulgent meals a la Chrissy Tiegen? 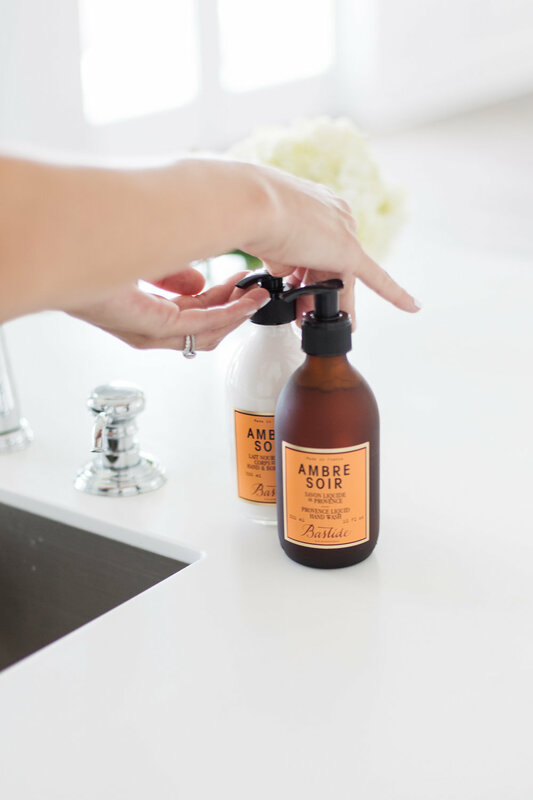 With one glance into the kitchen of Ashley Sievert, founder of Ashley Sievert Beauty, it's clear her kitchen is a space for easy entertaining just as it is a calm place for her family to start the day. "When we decided to build our home, the kitchen was very important to me. I had very specific ideas and wanted a clean modern look and feel. 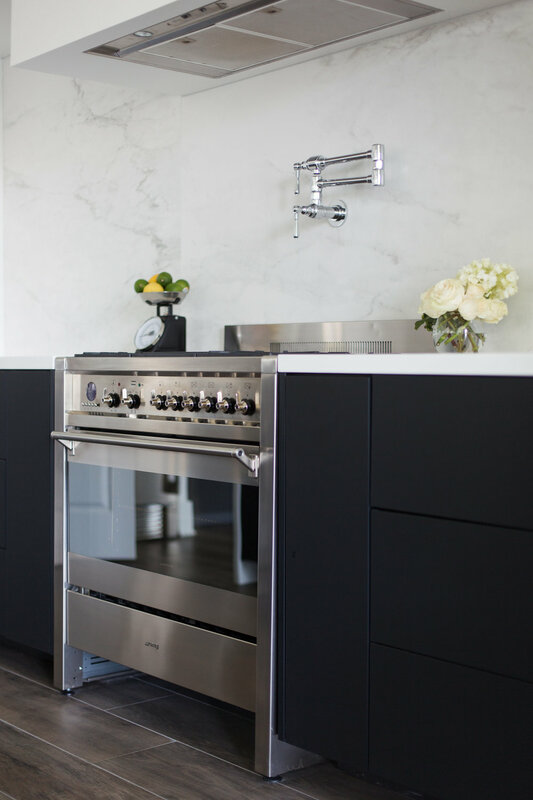 We definitely had many challenges because the design was out of the box a bit," Ashley shared as she welcomed us into a light flooded kitchen with a large, waterfall island and matte black cabinets that warms up the space. While she started with a blank canvas, the renovation didn't come together without difficulties. Ashley disclosed the process took well over a year and cautions the fragile porcelain backsplash had to be changed twice due to cracking during the process. Nevertheless, she continued working with a local builder to bring her vision to life, much of which was inspired by pins she collected on Pinterest. It's the little details like the use of cost-conscience Calcutta porcelain for a marble look and thoughtful storage design that were essential in her vision. As we nibbled on a cheese plate Ashley tossed together, she shared her how her goal was to minimize clutter so she feels relaxed when ordering in or assembling quick meals for her family. The paper towel holder, for instance, is nestled underneath the island countertop and outlets were also placed out of view in the pantry alongside typical countertop appliances. There's a mix of high and low. 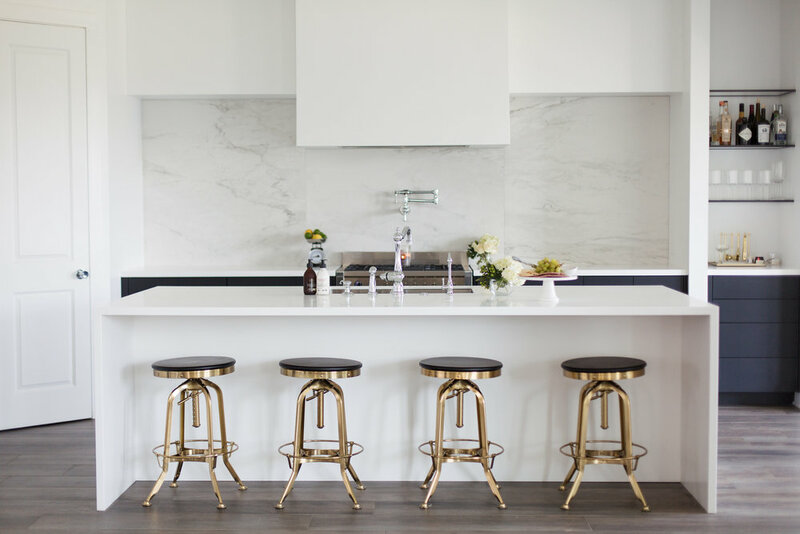 Where funds were mostly saved for cabinetry and appliances, Ashley shaved costs with accessories and dishware, and most surprisingly, the island as she opted for Corian, a material made of durable plastic. 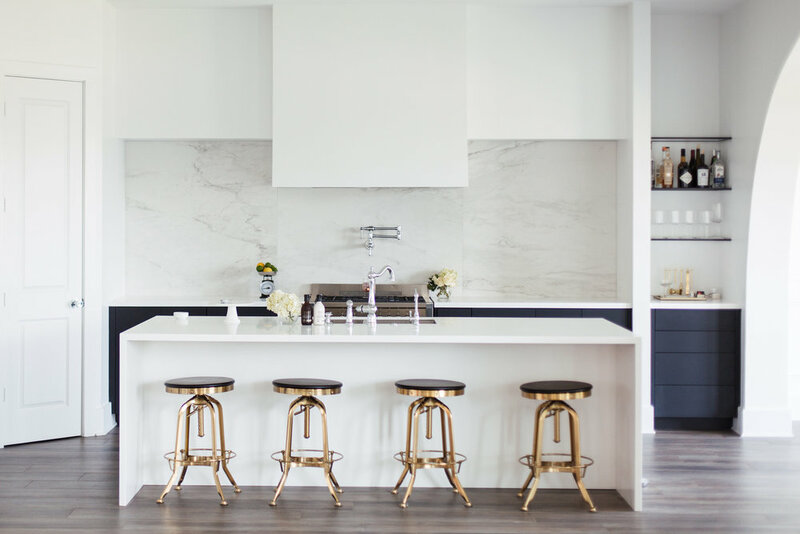 Ashley's kitchen is perfect for those who teeter between Carrie and Chrissy as it has all the resources necessary to cook elaborate meals but also inspires taking it easy. How do you take your coffee? I actually am not a coffee drinker! It makes me very, very hyper and feel out of control. The last time I had a medium coffee, I had to get an EKG haha. I may have a very small one every once in a while but won’t sleep that night at all. Favorite recipe? I am good at a few things but cooking and baking is NOT one of them. No matter how hard I try, I’m horrible! I do make a few things that are super easy and good- crock pot chicken tacos is my go to (chicken breast, 1 can salsa, 1 packet taco season) it shreds so easily. My husband actually cooks most of the time but we do a lot of ordering. What are your essential kitchen items? Does UberEats count?! I love the Crock Pot and use the blender often for Daily Harvest smoothies. Any frozen food hacks or items in your fridge that everyone needs to know about? There is a broccoli and cheese stuffed breaded chicken breast from Whole Foods that four-year-old son, Beck, loves. Favorite kitchen or home stores, favorite cooking products or kitchen trends that you have or are coveting? Most of my items are from CB2, Target, and Crate & Barrel! Favorite way to unwind? Watching TV with snacks! Favorite t-shirt and jeans? Any white boxy tee (Zara has great ones). I don’t care where it is from! Drink of choice? I love a pretty, fruity cocktail. What’s your “spirit city”--the one place that keeps you coming back? NYC- I love that larger than life feeling it gives. Favorite Instagram Account? I love Elsie Larson’s pictures! Her son Beck's artwork is a happy welcome into the pantry, which also stores her Keurig, microwave, and toaster. Thank you Ashley for letting us into your kitchen!